The winter months are generally a great time to spend indoors, enjoying the company of family and friends and indulging in large amounts of food. A lot of people tend not to exercise as much during the winter months because of the weather and their busy holiday schedules. There are many reasons for seniors to exercise, but did you know that it is even more important for seniors to exercise during the winter months? One of the most important reasons seniors should exercise during the winter months is to prevent sickness. Exercising has the ability to boost the abilities of the immune system and help ward off colds, flu, and other nasty sicknesses that are probably unwanted. Another good reason for winter exercise is to increase mobility. Colder air has been known to stiffen joints and muscles and reduce mobility, even so much as making simple getting around a painful task. Exercising can help not only loosen joints and muscles, but it can also strengthen joints and muscles and make getting around a breeze. If those reasons weren’t good enough, exercising during the winter months can help keep you from gaining what is commonly known as “holiday weight”. That’s the weight that one puts on after eating all the fat and carb laden foods that are common during the winter. There are many other reasons why exercise is important, but the above reasons are the most important for seniors during the winter months. Yes, that’s right, a video game is a good way to exercise during the winter. If you haven’t heard of the Wii, then you’re in for a treat. It’s an interactive video game console where you can play games, such as: bowling, baseball, tennis, hunting, and many more. The difference between a regular video game and the Wii is simple: the Wii forces users to actually make the motions of the game they’re playing. For example: when playing Wii bowling, you actually make the motions of lining up a bowling ball and move your arms like you’re actually rolling the bowling ball down a lane. Or, with baseball, you take a batter’s stance and swing the “bat”. This type of exercise has been shown to be extremely effective due to the fact that it doesn’t seem like you’re actually exercising. In fact, it’s quite fun to play the various games. Most people don’t typically think of winter and swimming in the same sentence. However, a lot of indoor public pools, like those at the YMCA, are open during the winter. A lot of them offer senior exercising classes that are a great way to exercise. The pools are heated, not generally crowded with people, and some places even offer winter discounts. 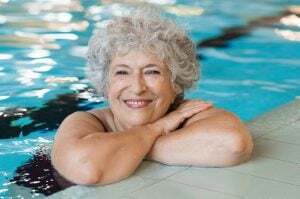 Swimming is a great way to get some exercise and is considered a low-impact exercise, which is perfect for seniors. No, we don’t necessarily mean walking outside when it’s freezing out, although if the weather is decent enough, head out and take in all the beautiful sights of winter. What we actually mean is quite simple, and mainly overlooked. If you have an area that is large enough, you can take a brisk walk. Try walking at a speed that’s a little faster than your normal speed. Then, as it becomes easier, increase your speed, safely of course. If you don’t have an area that’s big enough, try walking in place. It may seem a little strange to walk in place, but it is exercise. If you live in a Bonaventure Senior Living community, then you’re in luck. Bonaventure Senior Living has Fitness Perfected! How? We have professionally designed fitness classes that are built with seniors in mind. Not only are these classes indoors, away from the elements, but they allow you to go at your own speed and intensity. Each of our communities has Fitness Perfected classes every single day. Getting some needed exercise in the winter months doesn’t have to be a struggle. In fact, it can be quite easy and enjoyable. Sometimes thinking outside the box is all that’s needed to get a little fitness into your daily routine. Be well.